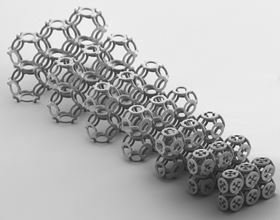 Scientists at KIT have managed to reverse a material’s Hall coefficient, by fabricating it as a ring mesh structure at a micrometer scale. Image: KIT. Inspired by medieval mail armor, scientists at Karlsruhe Institute of Technology (KIT) in Germany have produced a new metamaterial with novel properties. As the scientists report in a paper in Physical Review Letters, they succeeded in reversing the component material’s Hall coefficient. The Hall effect describes the production of an electric voltage across an electric conductor, transverse to an electric current in the conductor and a magnetic field perpendicular to the current. This effect is a basic phenomenon of physics and allows scientists to measure the strength of magnetic fields. It is the basis of magnetic speed sensors in cars or compasses in smartphones. In addition to measuring magnetic fields, the Hall effect can also be used to characterize metals and semiconductors, and in particular to determine a material’s charge carrier density. The sign of the measured Hall voltage allows scientists to determine whether the charge carriers in a semiconductor carry a positive or negative charge. Mathematicians had already predicted that it should theoretically be possible to reverse the Hall coefficient of a material (such as gold or silicon), i.e. to reverse its sign, if the material is fabricated as a three-dimensional ring structure resembling medieval mail armor. However, such a structure was considered difficult to make, as the microscale ring mesh would have to be composed of three different components. Christian Kern, Muamer Kadic and Martin Wegener at KIT’s Institute of Applied Physics have now found that a single material is sufficient, as long as the ring structure follows a certain geometric arrangement. To produce such a structure, the scientists fabricated polymer scaffolds using a high-resolution 3D printer, and then coated these scaffolds with semiconducting zinc oxide. Kern admits that this discovery so far has little practical use; there are already sufficient solids with both negative and positive Hall coefficients. But Kern wants to continue this research. The next step will be to produce anisotropic structures with a Hall voltage in the same direction as the magnetic field. Normally, the Hall voltage is directed vertically to the electric and magnetic fields. Such unconventional materials might be applied in novel sensors for the direct measurement of magnetic field eddies. This story is adapted from material from Karlsruhe Institute of Technology, with editorial changes made by Materials Today. The views expressed in this article do not necessarily represent those of Elsevier. Link to original source.